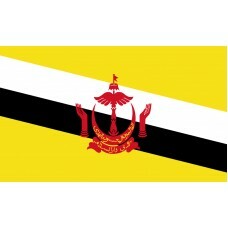 The Brunei Flag has a yellow background with two diagonal stripes going across with the colors black and white. 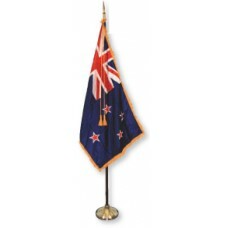 In the center it features the country’s national emblem. 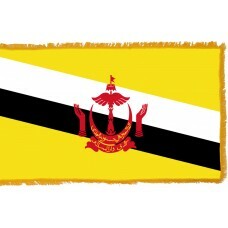 The yellow color of the flag represents the Sultan of Brunei and is the color used to signify royalty, and the black and white colors symbolize the chief ministers of the country. The red crest in the flag features five segments, which are the flag, the parasol, the wings, the hands, the crescent, and below the crescent is a banner. The parasol is the royal emblem and symbolizes the monarchy, the wings stand for the country's peace and tranquillity, the upturned hands are a representation of the government's agreement to protect the citizens' welfare. The crescent is the emblem of Islam and in the banner beneath, it reads, "State of Brunei, Abode of Peace." In the crescent, the national motto is written, which translates as, "Always Render Service with God's Guidance." Brunei is a very small nation on the island of Borneo. It is surrounded by Malaysia and the South China Sea. The capital and largest city of Brunei is Bandar Seri Begawan. Brunei was discovered by Awang Alak Betatar and when he found it, he exclaimed, "Baru Nah," which translates as "That's it." During the 15th, 16th and 17th centuries, the Brunei Sultanate and Brunei Empire ruled the nation. However, in 1888, the Empire began to collapse when the country was taken over by the White Rajahs of Sarawak. 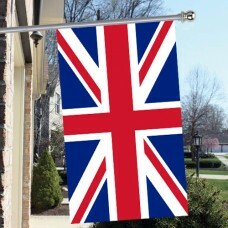 After that, the country sought help from the British and Brunei became a British protectorate. As a result of this, Brunei was ruled by the British for over 100 years until it finally gained independence on September 29th, 1959. Since the country gained its independence, it has been controlled and ruled by Sultans and it has been the same ruling family for the last 6 centuries. The national Brunei flag was adopted while Brunei was a British protectorate but even after they gained independence, they kept the flag. The country's main assets are its petroleum and natural gas fields. Due to this, Brunei is known for having the highest living standards in the world. A major landmark that the country is home to is the Sultan Omar Ali Saifuddin Mosque which is a popular tourist attraction that is thought to be one of the most beautiful mosques (even at night it glows) in Asia as well as a famous place of worship. One of its most noticeable and important features is the dome that is covered in gold. Brunei is also home to "Jerudong Park" which is the largest park in South East Asia.